Nicky Hamlyn studied Fine Art at Reading University. Since 1974 his films, videos and installations have been shown at various festivals around the world, including: Media City, Windsor, Ontario; 'Views from the Avant-Garde' in New York; Images, Toronto; the Rotterdam Film Festival and London Film Festival. He has had one-person shows at: LUX, London; Ann Arbor; the San Francisco Cinemathque; Pacific Film Archives, Berkeley and EXIS, Seoul. He has written widely on artists' film and video. His book, Film Art Phenomena (2003) is published by the BFI. He is Professor of Experimental Film at the University for the Creative Arts in Kent and Surrey. The 16mm films on this DVD reflect Hamlyn's early formation in painting and drawing, where intense observation was central to the effort to realise images of a visible world that is anything but straightforwardly apprehensible. All the work stems from the way the film medium lends itself to a particular way of structuring temporal images. 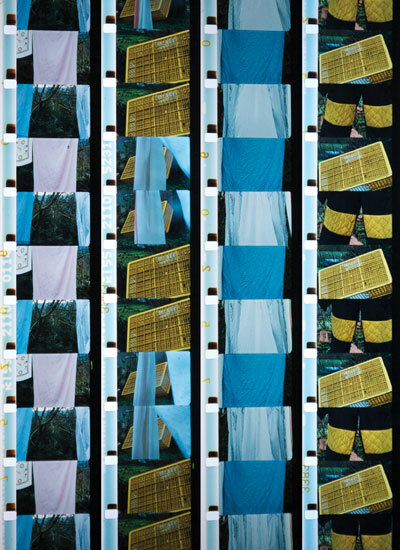 In the case of film, as opposed to video, the characteristics and constraints of the technology push one towards a way of working with the frame as the basic spatio-temporal unit of construction. Nicky Hamlyn studied Fine Art at Reading University. Since 1974 his films, videos and installations have been shown at various festivals around the world, including: Media City, Windsor, Ontario; 'Views from the Avant-Garde' in New York; Images, Toronto; the Rotterdam Film Festival and London Film Festival. He has had one-person shows at: LUX, London; Ann Arbor; the San Francisco Cinemathque; Pacific Film Archives, Berkeley and EXIS, Seoul. He has written widely on artists' film and video. His book, Film Art Phenomena (2003) is published by the BFI. He is Professor of Experimental Film at the University for the Creative Arts in Kent and Surrey.